There are so many reasons why I suggest you not build your house with the straw bales on edge. It’s hard to know where to start. I’ll just lay out the first ten that come to mind. 1. Strings on the exposed face mean no notching around posts and thus a thermal break at each post. 2. Bales are not sturdy. If you throw a bale off the stack it will land on the flat 99 out of 100 times, not on edge. 3. Any framing in the wall eliminates the running bond system, thus weakening the walls. 4. No weedwacking is possible to smooth the walls. 5. Running electrical is difficult because you have to cut chainsaw grooves around strings. 6. Corners are unsupported because you can’t notch the bales around the posts, therefore there is no overlap. 7. Niche construction means cutting the strings and weakening the wall. 8. The shape of the bales requires more stuffing when on edge. 9. The exposed surface of the bale has less “tooth” for plaster than when the bales are stacked on the flat. 10. Wall settling may be more as the strength of the straw bale is not from side to side but from top to bottom. Having worked with bales on edge on several occasions, I’m certain that I won’t do it again (if I have control of the project). The only reason I’ve heard as to why people think it’s a good idea and continue to do it is that it saves square footage because the bales are thinner in the walls this way. Let’s be realistic, you only save 4″ per wall and that’s not worth it in my opinion. If you plan to build with bales, you need to know that your walls will be thick. If that’s a problem for you, there are other building systems out there to consider or you can use a portable sawmill to rip your bales down by 4″ and then use them on the flat. That’s not ideal, but better than stacking on edge. I’ll write more about that process later. First of all: thank you for providing all this usefull information !!! 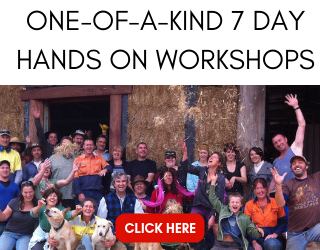 You are truly an inspiration for straw-bale builders like me! I can see why stacking strawbales on edge causes allot of problems. BUT I think however that it is possible and might even be preferable in certain situations… certainly when you adapt the design to this building method. But let me first be clear about my definition of stacking bales “on edge”… I’m not talking about putting them on their largest side, but I’m talking about putting them on their smallest side! So vertically. 1. Using roundwood as posts makes it possible to cut out a long vertical sleeve on the longest side of the strawbale. Leaving about the palm of a hand of straw on each side of the roundwood (I’m using metric system, so talking about palm of hand makes less confusion, hehe). This way, cold bridges are eliminated and your wood is protected on both sides. 2. Bales will get their strength and become sturdy because they are stuck around the posts. I put a post every two bales… so there is only one side left unsupported… I guess that will be allright. Strawbales can always be interconnected with sticks. 3. I found it quit easy to make a small sleeve on the top of the bale (when standing vertical) to put a piece of wood in the sleeve, underneath the strings. It even gives a stronger connection of the framing to the strawbale. 4. I’ve never tryed to put loam or lime on the side of the bales, but I’ve read in several books that plastering the side with the strings is actually easier than the other sides, because the direction of the straw fibres is favorable: the plastering won’t sputter off. 6. As I’m buidling an organic house, I don’t have corners, and so I don’t have this problem. 7. This is right. I took this in consideration and I’m allright with having only small niches in between the wires, to put a candle in or so… One of the main reasons why I chose to build a strawbale house is to have a great insulated building. Cutting out niches will make the insulation value a lot lower on those places. I’ll just make shelfs and so on interior walls. 8. As for my building I have to dissagree: My roof is waving up and down.. so I have different vertical distances to fill with strawbales. The only dimension that is variable on a strawbale is the length of the strawbale. This is due to the variable speed of the tractor making the bales on the field(well, at least here, in Belgium). Having a fixed width and height of the bales and having fixed distances in between the poles makes it possible to have a perfect fit of the strabales in between the poles. 10. Compressing the strabales after every row eliminates settling. Now, what are the main reasons why I chose strawbales on edge? – As I allready explained in point 8: strawbales have only two fixed dimensions and so makes it work more easy when putting them in between poles at a fixed distance. – It seems easier to make curved walls, because you work in smaller (and more) segments (using the width in stead of the lenght of the strawbale to follow the curve). – In stead of putting strawbales against vertical poles, I can integrate the pole in the strawbale, providing more strength to the whole wall.. I thought one reason people stacked on edge was to improve the R value. I and many others have been stacking bales on edge for many years now with great success. So here are my retorts to each concern. #1 A well designed bale home need not have any notching. #2 and #3 I am only talking about in-fill systems in which the window bucks (bale width) and corner post (again bale width) support the roof. Stacking the bales tightly between the “posts” and top box beam makes them very stable (we still use a running bond between posts). #4 I weedwack all my walls the weedwacker has never cut a bale string. #5 I rarely have to run electrical wires vertically up the bale wall it usually occurs horizontal or next to a post. #6 With bale width T posts at the corner it is much stronger than any single post surrounded by bales, and no notching is required. #7 With bales packed tightly between posts cutting a string or two has almost no effect on the integrity of the wall system (or just work between the strings or build out your niche). #8 A properly “edged” bale requires almost no stuffing in the wall. By this I mean using a quality hedge trimmer to square each end of every bale so it fits tightly to the next bale or post. Also, I find the stuffing of on edge bales easier because the gaps are not hidden like they are when bales are laid flat. Finally on this point you must be careful to stuff bale gaps between each course when laying bales flat. When laying bales on edge the whole project can be stacked and then stuffed after. #9 I find plaster tooths well either way. #10 Again a well designed post and beam infill system has the top beam at X bales high and you should be pounding that last bale in with a sledge hammer… no settling. Also, a proper load bearing wall should have sufficient compression strapping to prevent any settling. I also feel that an extra 46 square feet on a 1200 square foot house is significant. On my last two house projects (both about 1200 sq/ft) we stacked the bales in about six hours with a three man crew. I could write a 10 reasons to stack your bales on edge but I’ll save that for later (#1 You buy and stack less bales saving $$). I see only benefits to stacking on edge… unless you have a lot of notching (yuck!!). Thanks Doug. I appreciate your input. i imagine, like in any conversation, that we could both argue our points back and forth for days. No need for that. I can see merit in each of the items you describe and I can also find counterpoints to each point. Let’s just say that I am a firm believer in there being more than one way to accomplish a goal and that for myself, I won’t be building a house with bales on edge. 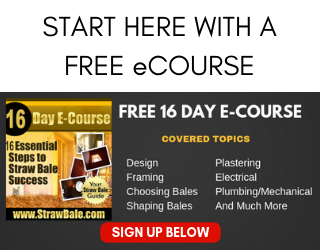 Great discussion on stacking flat vs. narrow or edge side of the bales. I am building with straw bales in Alamosa, Co. near the N. Mexico border, and we get a lot of wind, and when it hit 50 mph recently, it blew over two of the four walls I had set up on edge. I had used rebar stuck vetically between the layers of bales, starting with the first row by sticking the rebar into the soil, which is sandy clay out here. I had put the first mud coat on one wall, which stablized it somewhat, but that much wind was too much for the building to handle without having any wooden framework or roof to hold it down. I am now starting over with the same bales, laying them flat, cut side outside. There will be no plumbing or electrical, I use kerosene lamps and propane to heat and cool the refrigerator, off the grid and the only solar is the shower water I set out in a black bag to warm up in the sun–we get 330 days a year, 7 inches of moisture total yearly! I realize I am not operating under ideal circumstances, using my own soil on the property, but my total cost for a ten by 28 foot building should be less than $400!! (Not counting sweat equity!) Bales were $1.00 each, am recyling lumber from a stockyard, and used tin, etc. Can’t beat that with a stick! Thanks for the input Carl. Your project sounds pretty specialized and it seems that the installation of bales as you describe it was successful. That’s great. I think for the more common building, the bales on edge is a mistake for the reasons I laid out previously. Again, fore the right project, they may work as you described. I disagree with Andrew on the validity of stacking bales on edge. I like it. I note that many of the top builders, such as Bill and Athena Steen, use or prefer on-edge stacking. Both methods work fine, in my opinion. Each has different advantages and challenges. Here’s my take on Andrew’s 10 Reasons to Never Stack Your Bales on Edge. I will list Andrew’s reason text in full, and then my response. I agree that the strings are exposed, which makes notching difficult. I’m not a fan of notching, with bales flat or on edge, although it makes sense in some designs. It is disingenuous to say that no notching causes “a thermal break at each post”. It would be foolish to design a thermal bridge (not “break”) into your wall at every post (“thermal break” usually indicates something that stops heat flow; a “thermal bridge” allows it). Common methods for avoiding a thermal bridge include putting the posts fully inside the building envelope, fully outside, or insulating behind the posts with straw flakes or other insulation material. Or building Nebraska-style loadbearing designs. Each option has pluses and minuses. All testing shows that bales are plenty sturdy in either orientation. Jeff Rupert’s University of Colorado testing shows that bales on edge were substantially stronger than bales laid flat, in handling extreme loads (p.79, Design of Straw Bale Buildings: The State of the Art, Bruce King, et al, 2006). However, the differences are not relevant to building, because bales are strong enough in either orientation, wall loading in a house is much lower than in the tests, and the primary loads on a wall will be carried by the plaster skins, in any case. Or by the posts, if the building isn’t loadbearing. I don’t know if Andrew has actually maintained careful records of the side his bales fall on when he throws them off the stack, but this has nothing to do with sturdiness of bales in a building. It strikes me as odd that this would be used as proof or explanation. Perhaps it’s humor. Maybe I am missing something, but as I read it, this assertion is completely false. Running bond stacking is used in all the on-edge buildings that I have worked on, and most that I have seen in books and magazines. There are a few exceptions, of course, as there are for flat-laid. Re-tying bales to custom lengths is needed to deal with door and window framing, whether bales are laid flat or on edge. If this is about notching, then it is a repeat of item 1. I’ve helped with a dozen buildings with bales on edge, and they all had running bonds and framing. I’d go 50-50 on this one. Stacking on edge means walls are smoother to start with, and less weedwacking is needed. Removing the stray irregularities seems easier to me, when the bales are on edge. On the other hand, if you want to do major re-sculpting of a wall with a weedwacker, stack your bales flat. Depends. Almost all the electrical runs in a wall are horizontal, and the easiest option is to put the wiring between the bale courses. In any case, horizontal runs at any height won’t cross the strings. Some codes/jurisdictions have special rules, such as putting wiring in conduit. Vertical runs to switches and lights are likely to be near doors, and on interior, non-strawbale walls. The strings have the potential to be in the way in a few places, but the number is likely to be small. Or larger, if the wiring design is done with no thought to the bales. This seems like a repeat of number 1, with focus on the corners. It’s just as misleading. Every on-edge building that I have worked on, seen pictures of, or heard about, where bales meet at a corner, has overlapped the corners in the same running bond as flat-laid bales. Are these corners really “unsupported”? All the historical Nebraska buildings were loadbearing, with no posts at all, in corners or elsewhere. Many modern buildings are also loadbearing. So the corners can have plenty of support, with no posts at all. But supporting posts can also be placed at or near the corners when you stack on edge. See item 1 for a couple of the options. I’ve found that notching bales at the corner, where bales are coming from different directions on each successive course, is even less fun than notching in the middle of a bale. Worth doing, if that is your design, but other options exist. It almost certainly means cutting the strings, but it is doubtful that this weakens the wall. As mentioned above, the primary loads in a wall are taken by the plaster skins, or by the posts, and even unplastered bales create walls that are vastly stronger than they need to be to take building loads, according to testing. Windows and doors weaken the wall vastly more than niches, but we’ve figured out how to deal with that. Use similar strategies, if you are making a giant niche. By the way, some very well respected builders, such as Tom Rijven and David Lanfear, cut all the strings on every bale, in order to improve the strength and efficiency of their walls. Chris Magwood and others have experimented with stacking a continuous wall, and then cutting out window openings with a chainsaw. They cut a lot of strings, and their walls seem fine. Maybe, but I doubt it. The ends of the bales interface in the same way with either orientation, so the amount of stuffing between a pair of bale ends is the same. The depth of the wall is less with on edge stacking, and a wall needs fewer courses of bales for a given height. So I think on edge is ahead. If you pre-compress your wall, which I favor in every case, then on-edge bales conform to each other more, between the courses, than flat-laid bales, again leading to less stuffing. But both methods still require a lot of stuffing, for my tastes. I agree. The difference is noticeable, but not overwhelming. The best laboratory testing, which I quoted under item 2 above, is that strawbales are stronger on edge. Many people wonder about that test, but it is clear that walls are strong enough in either orientation, and again, the primary loads are carried by the plaster skins or the posts. The best historical testing is the 100+ year old Nebraska buildings. They are built with bales on edge, at least in the ones I know of that have been verified. In many of these buildings, you can tell bale orientation from the photos taken during construction, and from truth windows. They are loadbearing, and the windows and doors are intact, so there hasn’t been much settling. So my scoring is a bit different than Andrew’s. I agree with one of his points, and there are a few where I am in partial agreement. He is welcome to his opinions and preferences, but I’m bothered by the inaccurate reporting and illogical arguments in some of his points. My belief is that you can build great buildings either way, and that there are pluses and minuses for any and every building choice. I will add a few words on one question that didn’t enter into Andrew’s list. If you want to shape the bales or the wall in certain ways, there may be an advantage to one method or the other. For circular buildings of small to modest radius, it’s easier to form (distort) each bale into part of the needed arc, if they are on edge. But you have to sew the inside strings back to the bale, to follow the reshaped bale. It’s not difficult, but it takes extra time. Putting an arc in a flat-laid bale is harder (especially 3-string rice bales), but the strings are more cooperative, except in the smallest buildings. For large, round buildings, the bales don’t need to be distorted. Around windows, it’s easier to carve a small bullnose curve on a flat-laid bale. For a bigger (more normal-sized) curve, one of the strings of flat-laid bales gets in the way of carving your curve. Of course, there are ways to deal with that, such as running an extra string or two, to pull the main string off its course at the end of the bale. When carving a large arc on the end of a flat-laid bale, the straws tend to stick out in all directions like Pappy’s beard in the Popeye cartoons, which makes plastering a beautiful curve a little more difficult. It’s still quite doable. Re-tying an on-edge bale to approximate the bullnose curve shape that you want is possible with many bales, although again harder with rice. It means re-tying every bale around the window or door, but at least half of those have to be re-tied in most designs, flat or edge stacked. Some people would rather build the curve with lath, and stuff it with straw. I’m not a fan of that. The more low-relief sculpting that you plan, the more advantageous it is to lay your bales flat. I hope this helps those who are interested in the question. Thanks for the input Derek. I appreciate hearing different angles and points of view. Yes, I did mean “thermal Bridge, not Break.” Thanks for pointing that out. I have a few responses to your comments. 1. In terms of thermal bridging, you still need windows in the design and in a post and beam structure, you need some type of support for those windows. I believe that windows and doors should be placed to the outside of the structure and so having your structural supports for the frame entirely inside the bale wrap presents an issue. For sure, the frame can be built this way; however, you will need to install a secondary frame for the windows flush to the outside of the house (I don’t like window bucks as I think they are inferior to anchored framing for the proper installation and function of a window). This secondary frame will make it impossible to install the bales without 1) notching or 2) a thermal bridge of some kind. Nebraska style construction is off subject here as I certainly would not recommend, nor would I imagine you would, building such a project with bales on edge. 2. My use of the thrown bale was to point towards common sense. Have you ever stacked a bale wall on edge? How about one on flat? Which is more stable? Without question it is the one built on the flat. Let me put it this way: when a farmer stacks their bales in the field to be picked up by a squeeze, how are the bales stacked? On edge or flat? They are stacked on flat because they are more stable that way simply by the laws of nature. Something that is taller than it is wide is more likely to tip over. That’s all I’m saying here. 3. The running bonds can only be in place to the frame of the window. Perhaps you are using window bucks and so the frame of the window does not interfere with the running bond until the elevation of the window is reached. If you are framing your windows in, then the bond will be interrupted as soon as the bales make contact with the window framing since they cannot be notched. I am talking about the situation described in #1 where bales are wrapped around the structural frame yet come in contact with a secondary frame for the windows. Again, I think that using window bucks is an inferior window installation method and so I choose not to use it. 4. We seem to agree on this for the most part. 5. I don’t agree on your point here. Every exterior door is required to have an exterior light and a switch. This means that every door to the outside along a bale wall will have vertical runs in it. They may be near a door, but in general, they are not right at the door. Keeping costs down in electrical work is important in my opinion and one way to do that is to simplify the installation. To me, this means vertical runs simply go vertically, not over to a door, down the edge of the bales, back over to the switch location, etc… Furthermore, electricians like to see straight runs as it means simple installation and safe remodel work. In other words, an electrician likes to know that the wires coming out of a box go a certain direction so that they can minimize accidental contact with those lines in the future. 6. Not misleading at all. We’re not talking about load bearing structures here. We’re talking about post and beam. Again, load bearing structures should NOT be baled on edge, period. That’s my opinion and a strong one at that. In structural frames (in fill construction) the corners are totally unsupported. Overlapping corners is not the same as supporting them. If you have a series of bales stacked on edge, overlapping at the corners, all you have is just that, a pile of unstable bales. If you have bales that are pinched into the corners between the frame (notched in place) then they are fully supported by the frame. This may be more about the exterior bale wrap design than the on edge stacking, but I think it pertains to both since either way, there is not direct tie between the bales and the structure, making the corners less supported than a wall laid flat and notched. 7. There is a lot of experimentation in the bale construction world Derek and a LOT of it ends up in failure. Maybe not right away, but over time. I have heard of folks cutting the string on all their bales and I have never thought it a good idea. The strings are what hold the loose straw together, like it or not. If those strings are all cut out, then the only thing holding the straw in place is the plaster and the structure. If there is settling in the bales to any measurable extent, the structure will no longer be supporting the bales, excuse me, the loose straw. Plaster is an architectural cover. Yes, it is strong, but it should not be relied on as the main support for the structure. If you rely on the skins to provide you with the strength to hold your bales together, and provide strength to hold the corners together, and provide strength to resist shear loads, and provide strength to carry structural loads, you are asking for a failure in the overall structure. 8. I think this may be a result of bale quality. The bales I use on edge are very tight and brick like; however, if stacked on edge, there seem to be more gaps at the corners. 9. I think the “tooth” factor of the plaster to bale finish is a much larger topic than you give it credit here, especially with the amount of attention you give to the skins carrying loads and providing strength to the structure. Without a proper key from the plaster into the bales, the skins are separate from the bales and the strength you refer to is greatly diminished. It is not the skins, alone, that provide such strength, but the sandwich effect of the skins on either side of a wide base material (the bales). Again, without a solid connection between the two, that strength is greatly diminished. 10. Not sure I agree on this one. There is a lot of testing out there that I think has been poorly done. I am not sure exactly which test you are referring to here, so I can’t say for sure; however, I notice that you yourself note that the test is questioned by many. I don’t agree with you that I have presented inaccurate and illogical arguments. That’s a pretty strong accusation Derek and I disagree. 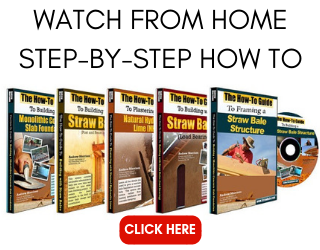 My reporting comes from first hand experience building straw bale homes as a contractor for 15 years and for teaching thousands of people how to build structures both hands-on and through my DVD series all over the world. To me, my arguments are both logical and accurate. I hear that you disagree, and that is more than fine. I am a firm believer in the fact that there are many ways to build things and many ways to learn. I simply present what I believe to be the best ways, those which I have learned from experience. So, I appreciate your feedback and I disagree with much of it. I don’t think you are illogical or inaccurate, I think we simply disagree, that’s all. Thanks for your response, Andrew. My goal is not to create conflict, nor to argue against your preferences. It’s fine that we have different opinions. It’s less fine, from my point of view, to present, as statements of fact, flat assertions that are simple to verify as being contrary to documented experience of others. Your more lengthy descriptions of your methods and reasoning, which you give in your responses to my comments, help me understand the reasons for your preferences and the advantages of building the way you build. That greater detail is welcome and useful for me. I will just revisit a few points. If you don’t like the terms “inaccurate” and “illogical”, I can accept others. I don’t question your knowledge and experience. I question some of the statements that you made. Whatever term you use, I see problems with saying, as in reason 1, that bales on edge have a thermal bridge at each post. My counter argument is that those who choose to build post and beam structures with bales on edge do not have a thermal bridge at every post. To here, I think my disagreement with the words in your text is pretty straight forward. I can appreciate the points you make in your response to my comments, but I was responding to your original text. Not everyone builds as you build, nor frames as you frame. Those with different methods have solved the thermal bridging question. Your way may be superior, and I like learning about it. In reason 2, you say that bales on edge are not sturdy. I gave you the title, page number, author, and publication date for the summary of the research that describes the opposite conclusion. This same research, and that described on adjoining pages, indicates that bales on edge are adequately sturdy. This book, Bruce King’s “Design of Straw Bale Building”, is the most authoritative reference in existence for strawbale building. This same research, conducted by Jeff Rupert, et al, at the University of Colorado, applies to reason 10. Common sense is fine, but it often doesn’t inform usefully on engineering questions. It is always true, as common sense dictates, that a building could be made stronger while making it bigger, heavier, wider, and more expensive (in functional ways). But it is counterproductive to make building elements stronger than they need to be, including adequate safety margins, of course. How strong is strong enough? Again, the best evidence that we have for how long strawbale buildings can remain sturdy, is from the oldest strawbale buildings, which are on-edge, loadbearing buildings in Nebraska, some more than 100 years old. Your buildings may be better. Your buildings may be more sturdy. But the Nebraska buildings have proved that they are sturdy. Perhaps of slightly more interest to other readers is our difference of opinion on reason 5, electrical wiring. It is certainly true that exterior doors must have light switches near them. The switches are usually within a few inches of the door, and inconvenient if more than a foot away. Lights outside a door are most often right above the door, which means that horizontal runs are inevitable. Lights are also often above the switch near the door, or on both sides of a door. So there is more variation for the lights than for the switch. You mention the importance of keeping costs down, and I agree. Compare the cost of notching flat bales vertically several feet, versus the cost of running a wire horizontally four to twelve inches, and then vertically with no notching, along the door frame. I think it is much cheaper and quicker to do the latter. Depending on your framing design, there may be some notching of bales above the door, or there may not be. I agree that for future remodeling work and safety, it is important to get some idea of where the wires go, by looking at where the wires exit a box. I have confidence that the remodeling electrician, seeing the wiring exiting a box from the side that is adjacent to a door frame, will draw the correct conclusion. In any case, this is still a small percentage of the wiring question. Again, your way may be the best way, but other builders have found acceptable solutions using different methods. Thanks again for your response, and for providing more detail. Derek. Thanks for the continued conversation. I appreciate the exchange and you sharing your experience and knowledge as well. I too enjoy the process of learning and seeing new ways to do things. In fact, one of my favorite past times as a builder is to stop by other job sites (conventional or straw bale) and talk to the builder about how they accomplish the process. I’m clear that this openness may not have come across in my initial response to you and for that I am sorry. My want is to learn from my experience and from the experience of others. Having had several bad experiences with working on houses that were designed to have the bales on edge, I am inclined to steer people away from such a design, and quickly. To be honest, I have never worked on a building where the bales were on edge where I was happy with the process, and I can see how that has influenced my opinion. It is also clear that you have had a different experience with buildings baled on edge, and I am glad to hear that you have specific reasoning for your comments. In the past, the only argument I had heard from people was that it saved floor space and thus the property taxes were more in line with the actual usable square footage of the home. That wasn’t a good enough argument to overpower my experiences with working with bales in such orientation. I have read Bruce’s book(s) and Jeff’s as well and I see them both as clear, intelligent and experienced authors on the subject. I did not remember the specific details of the “wall sturdiness” that you refer to and I will have to revisit those publications in the coming days. I hear you about “how sturdy is sturdy enough?” and I should say that I have always been a fan of building stronger than code. I know that code represents a bare minimum and that even wood floors that pass code still deflect and move far more than I would accept in my own home (not directly related to this conversation, but an example of what I mean). Because of this, I have always built my homes to exceed code and be “sturdier than required” in some people’s eyes. At some level, there is added expense in doing this, and from another point of view, it actually saves money in the long term. However you see it from your perspective, I can see how that too has affected my opinions on this matter. So, I appreciate your continued conversation and input. I have learned a lot from even this small exchange about how I have perceived baling on edge. I still prefer baling on the flat; however, I’m definitely open to hearing more about the value of the method as you see it. Thank you and I hope to hear more from you as time moves forward. Hi, Andrew. I, too, appreciate the continued conversation. I’m glad that we have gotten through to a greater understanding. I’m always a person who argues for more options. And just to clarify my position, I’m in favor of building with bales flat when appropriate. Which is a majority of the time, in my opinion. And I also believe that stacking them on edge is a good choice some of the time. I resonate with your comments on codes. I like the phrase, “Building to code is building the worst house you can, without it being illegal.” But in fact, codes are a mixed bag. Sometimes they are overly cautious, sometimes they offer good guidance, and sometimes they are inadequate, prevent useful innovation, or actually require building less safely or comfortably. I’m with you, in wanting a stiffer floor than the code requires, unless it is a dance floor. Thankfully, there are areas where the codes allow doing more than required, and building a better home than the minimum. I appreciate that this is the choice that you make. I like that phrase Derek and I totally agree with you about the mixed bag that codes provide, especially when building “alternative” structures. I have been required by building departments to build structures in ways that I KNOW will be more likely to fail because of codes and have had to instead incur the costs of engineering to avoid that process. That’s a bummer, but was worth the cost to me in the long run. I’ll keep following on edge conversations and will look for where they make sense rather than blanketing them with the “bad” stamp. Thanks for the insight and follow through. Hi Derek and Andrew. Thanks for having this debate so thoroughly. It will be a great reference for others for a long time to come. As a builder who used to say things like “I avoid ever building on edge” I have tempered my ways to see that there are good designs and good reasons to build on edge and they are some of the best straw bale systems I know but they are limited. David Arkin and Anni Tilt have made a great deal of progress with their I joist frame-bale on edge-Spray stabilized earth system. And I’ve used bales on edge especially in larger buildings. Access to Dennis Lagrande’s 2 sting 18″x16″x46″ rice straw bales that are contained on 5 sides and cut on the bottom make most of the argument mute. But I still will try and talk most people out of using bales on edge mainly for the ease of dealing with the unpredictables that bales laid flat offer. The one thing I would add is that more than anything it depends on the bales. Sloppy wheat bales I’d be really reticent to bale on edge. A jagged dense rice bale I might prefer them to key into each other on edge with exterior pinning the diminished height to width ratio would be fine. Also I want to add that the running bond issue is less of a concern on edge and if you have good bales. especially if you have any mesh reinforcing in the plaster. OK. that’s my two cents. Thanks again for the thoroughness of your debate. Thanks Tim. I have always likes Dennis’s bales and I agree with you about the negligible difference in width to height. That’s certainly an advantage. A very interesting and illuminating discussion. Personally I prefer on edge even for Nebraska style, though the building codes do not allow it. Since I am using three string bales, the size difference is not so negligible – 17 vs 24 inches is 7 inches. My primary concern however is cost – it takes fewer bales for a given wall area so cost is lower. Also I use sharpened doug fir fallen branches or the thin tops of thin young fir trees in place of rebar pins. If I was pounding pins this size into laid flat bales I suspect I’d be popping lots of the bale strings. Which it appears might not be all that critical in a laid flat application. I posted back in 2010. 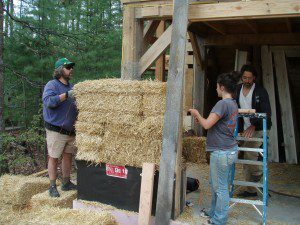 Since this article comes up first when you google “straw bale orintation” and is a great discussion about bale orientation I am posting again: going into more reasons why I like to stack on edge. I am also always happy to stack flat if the client wishes. After many years of stacking bales in both orientations I have found using bales on edge has more advantages for me. First and foremost I like that it saves floor space. A rough run down of savings follows: Using an example of a 30 foot by 50 foot house dimension you gain 50 square feet of interior floor space by placing 2 string bales on edge (using 18″ w x 14″ h x ~36″ L bales). Using a low to mid range cost of 150 dollars per square foot to build said home we see a 7500 dollar savings. Of course, you must actually reduce the size of the home footprint to account for the extra space the bales on edge give us to realize the savings. My next favorite advantage is ease of installation. The installation issue has more to do with using bale width posts than bale orientation. Notching bales laid on edge around posts is difficult because the strings end up facing out from the wall this requires a no notching framing system around posts and logically leads to the bale width post. I figure when stacking bales in this way it can be done in 1/3 the time of a post notching system. Also, because the bales are squeezed between these bale width posts I end up with a much tighter wall. Another major perk of this no notching system is safety. The chainsaw is the tool of choice for most builders to notch bales. These tools are not only dangerous and expensive to operate it makes bale construction less accessible to people with out these specialized tools. Furthermore, the chainsaw is not designed to cut through a dry, dusty, often pebble filled straw bale and the process is hard the equipment. Also concerning safety and ease of construction I end up with a 14″ box beam on which the roof is built. This make for a nice safe platform to work the trusses. Third on list is the fact that when the wall is thinner your widow wells require less time and plaster to finish. We all know that these openings take many hours to prep and plaster. If you are doing tile or wood sills you also save time and material in this regard. In no particular order here are some more points of bale on edge construction. We use less concrete in our footings under the bales. If you like to external pin you can use the exposed strings to weave your pins through. Thinner wall makes windows and door opening less “cave like” and lets in a bit more light. We use less bales to achieve the same wall height. I like that you can stuff straw or light clay straw into gaps where bales meet each other after the entire wall is stacked. When bales are laid flat you must do the stuffing between bales as you go and often novice stacking excitement over runs the need to get these gaps filled. Any other factors in the stacking process that are cited as a pro or con in the orientation debate I have found an easy “on edge” work around for or find the advantages of edge stacking out weigh the minor issue. Thanks to Andrew for forum to discuss straw bale topics in the bale world. This is a graphic animation of my preferred wall system. I should also note that I am now using straw clay slip forming to create some window bevels and detailing. This gives a very clean look to window bevels and I feel is a better plaster matrix/substrate (then say just chainsawed window angles) in these more difficult plaster areas. My sister is currently building a 950 sq ft strawbale home in Arizona. She is single and limited on funds and the modular she is in is falling apart. She does not have a builder. She hires out the work and has the help of our brother-in-law, who is also in the process of building a strawbale home, only much larger. He used 3 wire bales. The small home my sister is trying to build was actually going to be his guest home but he decided not to build it and gave the plans to my sister. So far, she has the concrete foundation poured and the block columns up. Now the problem — She is now ready for the straw bales; however, she is at a standstill because she can’t find 2 ply straw bales anywhere in AZ and to get it from another state you have to order $600+ and pay for shipping. She can’t use 3 wire bales because they won’t fit within the blocks if they are stacked flat. My sister has a lot of her savings already into the little house and we feel her only option now is to stack the 3 wire bales on edge. My concern is if the blocks were built to house 2 wire bales, will 3 wire bales fit stacked on edge. If so, that would be her solution; however, if not, does anyone know what she can possible do at this point. Any comments would help. Thanks. In a situation like this, if the bales fit on edge, then I would suggest using them that way. It will make some of the later steps harder, but it would not be the end of the world. Another option is to see if there is anyone with a portable sawmill that would be willing to let her use it to resize the 3-string bales down to two string size. The good news is that her project will not be heavily hampered either way.